The winner of the 2017 Edwin Ballard Prize is Dieter Lohmar’s Denken ohne Sprache. 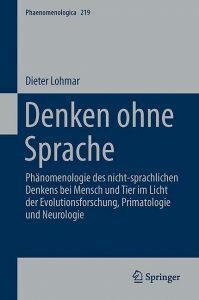 Phänomenologie des nicht-sprachlichen Denkens bei Mensch und Tier im Licht der Evolutionsforschung, Primatologie und Neurologie, Phänomenologica Vol. 219 (Springer International Publishing, 2016). The Introduction to this fine book (Chapter 1) begins with a striking example. You’re sitting there, thinking about some future course of action, already aware that your plans may be problematic and might not be accepted by everyone. Suddenly, an image “mentally” hovers before you—for instance, the face of a good friend, or your grandfather’s face, with a look of concern. You realize that what you’re thinking about doing is a little too problematic, and you begin to reconsider your plans. As the author says (1), “What’s going on here?” To be sure, both the author and the reader may be using language to present the example, but is the image itself something “linguistic”? No—yet what you saw in this “phantasmatic seeing” (1) had a significance that led you to consider the consequences of your proposed action and alter your plans, casting around for other ways to achieve your goal. This, then, is the key to the thematic field of Lohmar’s investigation: being aware of possible consequences and reconsidering a course of action (e.g., by imagining alternatives) is a type of thinking. More specifically, there is such a thing as a non-linguistic thinking that is directed toward one’s future course of action, and may be described as a “scenic-phantasmatic system of representations” (1f. ), here understood as short-term, “daydream”-like images that are not at all a retreat from the realm of reality to that of phantasy, but a way of thinking over alternative possibilities (cf. 223). It becomes clear later in the book that other non-linguistic systems may involve gestures, etc., but the author’s chief contribution is to clarify how such a “scenic-phantasmatic” system functions. One main task of the book is accordingly the task of showing that we can reflectively discern and describe this type of thinking, and need not automatically accept the presupposition that all “thinking” is linguistic. Or to put it in other words, what the author is carrying out involves two main moves of Husserlian phenomenological method—critique of presuppositions and retrieving the styles and structures of functioning subjective life from anonymity—and fundamentally relies upon the Evidenz concerned, sharply distinguishing the phenomenological turn to the matters at stake from the use of “arguments” (although as we shall see, arguments too play a role in the book). And the author even explicitly makes (8; cf. 12) the classically Husserlian gesture of appealing to the reader to become a co-researcher, consulting his/her own experience for further examples of the experiential structures at stake. Of course, the notion of non-linguistic thinking is not new—many scholars recognize that there is more to “thinking” than the concepts and propositions that certain philosophers insist are necessary. And the author himself wonders why someone else hadn’t already written this book (9), because once we start investigating non-linguistic thinking, we find that it’s an “open secret” (9), a pervasive phenomenon, and moreover, one that leads to an “inclusive theory of thinking” (10)—a theory that is relevant for both human and non-human animals and leads us to see that something like “representation of cognitive contents” (11) can be carried out in at least two ways: non-linguistically, via a fundamental symbolic system (strongly influenced by feeling) at work in individual experience, and linguistically, via a system based on the latter but permitting public communication and further forms of thinking. The author is, of course, aware that his work runs counter to the “linguistic paradigm of thinking” found in orthodox philosophy of mind (14). But the great thing about this book is that his response not only assumes that phenomenological means can be used to address non-linguistic thinking (4), but actually puts these means into practice by carrying out phenomenological demonstrations, providing numerous descriptive analyses of the type of “pre-predicative experience” (20) at stake rather than merely offering linguistic arguments for and against various philosophical positions. How does Lohmar set about accomplishing this? Chapter 2—“The possibility in principle of non-linguistic systems of representation”—is (despite sections addressing objections from Donald Davidson and others to the very possibility of non-linguistic thinking—see 2.5–2.6) primarily a matter of method, in the broad sense of explicating the tools and strategies needed for the investigation. The broadening of the notion of “thinking” to include non-linguistic as well as linguistic systems of representation is worked out in terms of Husserl on Erkennen/Bedeuten in the Logical Investigations, especially the 6. LU (see 2.1–2.3), and basic types of non-linguistic representation are distinguished (2.4). [As Lohmar says elsewhere, it is “essential for phenomenologists to understand that Husserl’s theory of meaning leaves open exactly a place for non-linguistic thinking”—see Dieter Lohmar, “The Unconscious and the Non-Linguistic Mode of Thinking,” in Unconsciousness Between Phenomenology and Psychoanalysis, ed. Dorothée Legrand and Dylan Trigg (Springer, 2017), 209–21, here 211 (and see 210ff. for a brief introduction to non-linguistic thinking).] One of the most important points is that “thinking” in this broadest sense is more than calling up contents once again, but involves active engagement with what is thought, even if it is given symbolically rather than being intuitively fulfilled (39f.). Of greatest interest to me, however, is 2.7, “On the relationship of phenomenology and empirical sciences—the phenomenological project.” Is any attempt to initiate such a relationship forestalled from the start by the transcendental reduction? Lohmar’s response is to point out that eidetic method is equally important for phenomenology and is only necessarily combined with the transcendental reduction when our project is one of “laying foundations” through a radically presuppositionless “first philosophy”; an eidetic phenomenology of consciousness need not proceed transcendentally. But even such an eidetic phenomenological psychology can contribute in its own way to the Grundlegungsprojekt when the latter project is thought “vertically” and the eidetic descriptions are seen as helping to establish the foundations of the human sciences “from below” as well as exerting an influence “horizontally,” as it were, in many disciplines (52f.)—cf. phenomenological sociology, phenomenology of nursing, etc. Thus Lohmar’s project involves a mundane phenomenology that can legitimately enter into dialogue with empirical sciences, and for me, in his approach phenomenology maintains its own integrity rather than being reinterpreted or truncated “in light of” the aims and assumptions of these sciences. Nevertheless, the positioning of the next chapter might seem to support the idea that phenomenology must somehow be seen “in light of” empirical science after all, for as its title indicates, the chapter advances “Arguments for the real existence of non-linguistic systems of representation,” and these arguments are drawn from human evolutionary history (3.1); cognitive achievements of higher animals (3.2); and mental achievements of humans in whom language is lacking (3.3). Perhaps as a phenomenologist, one might not see the need for such “arguments for the existence of” the phenomena in question. But the author may have been thinking of a broader audience, and if so, this chapter plays a rhetorical role, using, for example, primate research to convince the reader that there are alternatives to conceiving thinking as exclusively bound to the use of language (see, e.g., 75f.). With Chapter 4, however, we return to the task of demonstrating—“with the help of phenomenology” (83)—a non-linguistic system of representations in our own consciousness, beginning with the most basic system, the scenic-phantasmatic system (4.1). Here, for instance, the author describes the vagueness and typicality of what “phantasmatically” comes to mind; introduces the notion that through phantasmatic repetition of the situation in question, one deviates from the original situation and develops possible alternative courses of action (4.1.3.1); emphasizes the role of feeling (4.1.4.1–4); and includes (as already mentioned in n. 1 above) the intersubjective dimension of feeling and willing with others (4.1.5) before turning to the uses of glances, gestures, etc. (4.2). By now the author is mingling eidetic description with material from other sources (Daniel Stern on early childhood communication, empirical studies of cooperative action among primates or daydreams in rats, etc.) as well as making use of lively examples drawn from everyday experience (e.g., being in a country where you don’t speak the language and using pantomime to tell a taxi driver that you need to get to the airport as quickly as possible—136f. ), and this pattern continues in Chapter 5 on further modes of non-linguistic thinking in, e.g., self-awareness (5.1), social intelligence (5.2), cooperation (5.3—see, e.g., 171f. on soccer), and other areas. Chapter 6 reiterates the central thesis of the book—namely, that we use not only language, but non-linguistic systems of representation in everyday life (188)—and contrasts scenic-phantasmatic thinking with linguistic thinking (what does each do best? ), concluding that the latter is founded in the former. Then Chapter 7 addresses conflicts between the two systems, considering such topics as neurotic displacement, what happens with traumatic experience, etc. ; next Chapter 8 applies the notion of the “analogical” semantics at work in non-linguistic systems of representation (a semantics based on similarity, in contrast to the “convention”-semantics of language) to the field of therapy as well as to thinking in mathematics and technology. The final two chapters (Chapter 9 presents Temple Grandin on her own “thinking in pictures” and how it relates to understanding animals, while Chapter 10 responds to José Luis Bermúdez, Thinking without words) feel more like appendices, but are certainly relevant to the book. And in introducing Grandin’s work, Lohmar explains why he has not featured her descriptions of autistic experience until this point in the book: namely, because his point of departure has been the forms in which the scenic-phantasmatic system shows up in the everyday experience of normal humans (266). And despite all of the many points of dialogue with primate research, etc., this simple statement sums up the value of the book for me: it offers detailed phenomenological descriptions of a style of thinking that phenomenologists have hitherto hardly addressed (and that other philosophers have simply refused to acknowledge, since they define “thinking” in terms of language from the very beginning). How can all of this be summarized? Husserl insists that the phenomenologist must be absolutely independent from all other sciences, proceeding only via his/her own original seeing (35/476). However, he also tells us that other sciences must have recourse to phenomenology, and phenomenology must even be propagated in them (35/292)—which may require hands reaching out from both sides, as it were (35/306), eventually leading to a situation in which scientists of every sort would be as at home in phenomenology as physicists are in mathematics (35/307). Lohmar’s work fits right in with this possibility by simultaneously contributing original phenomenological descriptions of non-linguistic thinking based on firsthand experience and highlighting convergences with other sciences that also focus on sentient beings and the nature of their sentience. There are many excursions here into the findings of other scientists, but only a phenomenologist could have written this particular book. That is why the Directors of the Center for Advanced Research in Phenomenology are pleased to award this book the 2017 Ballard Prize.